Many Hindu families and Awami League men in Patgram upazila of Lalmonirhat fled their homes yesterday following repeated threats from Jamaat-e-Islami and its student wing Islami Chhatra Shibir. 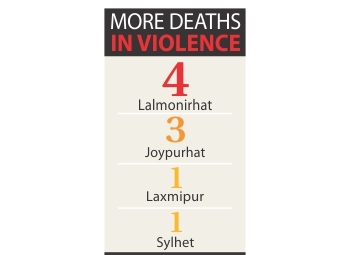 As violence continued to escalate, four people were killed in the upazila and five others in Joypurhat, Laxmipur and Sylhet districts throughout the day. At least 57 were injured across the country. Minorities came under attack also in Satkhira. In different parts of the district, alleged Jamaat-Shibir men have burned and vandalised at least 36 houses and shops belonging to Hindus since the execution of convicted war criminal Quader Mollah Thursday night. In the same village, Hindus came under attack on November 28 during the opposition’s 71-hour blockade. Alleged Jamaat-Shibir activists beat up at least 12 women and children and torched and looted at least five shops and two houses. In this village too, Jamaat-Shibir men along with BNP activists unleashed a terror on a Hindu neighbourhood on October 28. Rabiul Islam, an AL activist of Kafir Bazar village, said many of his party colleagues fled away with their family members fearing Jamaat-Shibir mayhem, though law enforcers assured them of tight security. Other villages which were deserted include Awliar Hat, Bawra Bazar and Beltoli. Upazila Chairman Ruhul Amin Babul said many identified ruling party men have abandoned their houses. Around a hundred local AL activists and members of the Hindu community received threats from Jamaat-Shibir men that their houses will be torched at night. “I’m also not safe,” Ruhul Amin said, adding that law enforcement agencies had increased patrolling in these areas. Officer-in-Charge Sohrab Hossain of Patgram Police Station said he has information that Jamaat-Shibir men planned to commit atrocities against AL men and Hindu homes in these villages. Also yesterday, a clash ensued when police tried to disperse Jamaat-Shibir men blockading the Lalmonirhat-Burimari highway in Patgram around 7:30am. The blockaders threw four crude bombs at police, triggering an exchange of fire that left one Shibir man dead on the spot. Two injured Shibir activists died in hospital. The dead were Manirul Islam, 28, Abdur Rahim, 30, and Saju Islam, 24. In retaliation, Shibir activists hacked AL activist Mintu Islam to death in broad daylight, dragging him out of his Kafir Bazar house around 12:20pm. The highway clash also left at least 30 injured. They include seven policemen and 10 ordinary citizens. At least 11 houses of AL men in Kafir Bazar and two belonging to Jatiya Party men were torched and looted. Also in the upazila, 180-feet rail track was uprooted and a hundred fish plates were removed near Bawra Railway Station. With 252 feet of railway tracks at Pirgachha upazila in Rangpur uprooted, train services on Dinajpur-Dhaka and Lalmonirhat-Dinajpur remained suspended till around 9:00pm. A train also derailed in the district. In Sirajganj, pickets damaged two bridges in Konagati and Bawoitara in the early hours of yesterday. They also vandalised a private car. At least two cops were injured when Jamaat men hurled bombs at a police van. In Joypurhat, Mohammad Firoz Hossain, 30, a rickshaw van puller, was killed being caught in a gunfight between Jamaat and law enforcers. Jamaat men Shamim Hossain, 24 and Insan Ali, 22, were also left dead. After around a thousand Jamaat-Shibir men encircled patrol police team, BGB and Rab members rushed to spot and the gunbattle began. Mirajul Islam, 22, a Chhatra League activist, was killed in Laxmipur. A group of Jamaat-Shibir activists attacked him on his way to a relative’s house and slit his throat, our correspondent quoted the district Chhatra League president as saying. In Sylhet, an AL man named Nazrul Islam, 35, was hacked to death early yesterday, while returning home from a procession. A freedom fighter named Hazrat Ali, 55, suffered serious injuries in a Jamaat-Shibir assault in Shajahanpur upazila of Bogra yesterday morning, his family said. In Pirojpur, alleged Jamaat-Shibir men torched the house of a union-level AL leader Bidhan Chandra Mistri. They also dug up the roads leading to the closest fire stations in Pirojpur and Nazirpur, thereby preventing fire fighters from reaching the spot. At least 25 were hurt in Rajshahi and Pabna during clashes between Jamaat-Shibir and AL and law enforcers. In Khulna, police arrested district Jamaat Assistant Secretary Zahangir Hossain Helal. Several bombs were exploded in front of the daily Sangram in Dhaka around 11:30pm yesterday, police say.